I'm having some trouble getting my F3 Darksoft kit working, my Motherboard is tested working ok with a cart. I'm using a 1GB SanDisk micro SD and I've tried two different SD cards. I can scroll through the games list on the LCD and it will write to flash and it then tells me the game is loaded, but nothing is showing on the monitor, just showing like there is no cart installed on the motherboard. Please can someone point me in the right direction. Do you have the reset wire installed? If not you should just need to reboot the system for the game to start. I've now installed the reset wire and it holds it in reset while the flash is loading, but then go's back to the no cart installed screen. Correct me if I'm wrong, but I thought the reset wire isn't needed to reboot the system after flashing? I thought the reset wire was to stop the system outputting any video during the flashing process? I don't have the reset wire installed and my board automatically reboots after flashing is complete. Yeah that's true. Hmm. I certainly could be a sd card or game file issue. I’ve tried 3 different SD cards now, still the same fault. A bit of contact cleaner and re-seating the pcb seems to have fixed this. Yes all sorted, it’s still working fine. Thanks @penrhos. So reseating was the key this time. Well spotted. 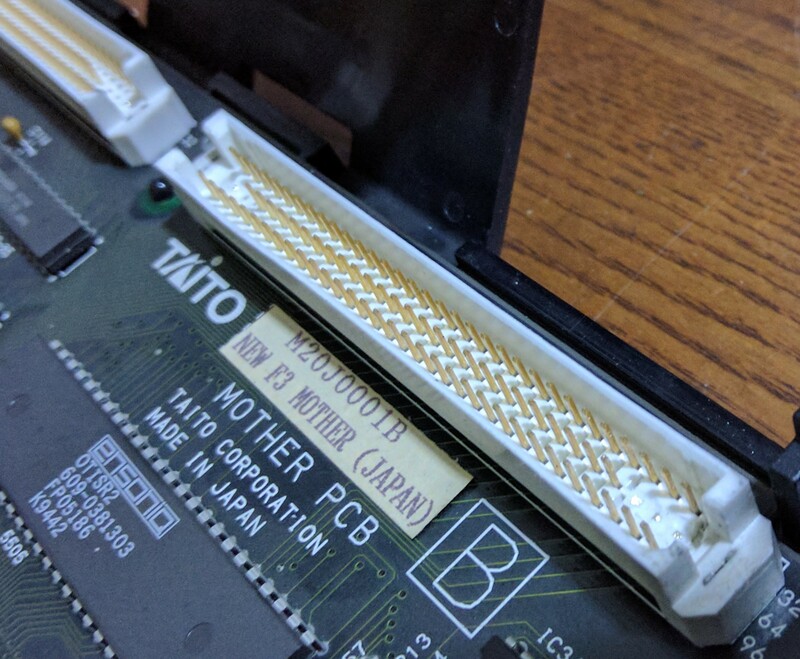 i've got a question regarding the Taito F3 setup, i've just got hold of a japanese motherboard, like the cps2, do i need to buy an original game? and is there anything else i need to get or do? before i buy the kit. You might want an original game to rob its cart shell, but no you don't need one. What you will need to do is region free that motherboard, this is done by removing pins/security tabs in the cart connector. I went for the "gold" and ground/Drummeled the F outa mine (you prob don't need to be as aggressive as most just snap them out).